Wellness Tourism Worldwide (WTW) is an ideal resource for editors, journalists and writers. Wellness Tourism Worldwide President & Founder, Camille Hoheb, is regularly available for interviews, comments, or assistance in developing health-related news stories. WTW serves as a resource link to an array of experts within the health, wellness and travel communities. Ms. Hoheb and Wellness Tourism Worldwide have been featured in Travel Market Report, Travel Trade Weekly, Travel and Tourism Research Association publications, Spa Mantra, Medical Travel Today, Health Tourism Magazine, Corporate Wellness Magazine, Yoga Magazine, Beauty Confidential, Scottsdale Living Magazine, Day Spa Magazine and Massage Therapy Journal among many others others. 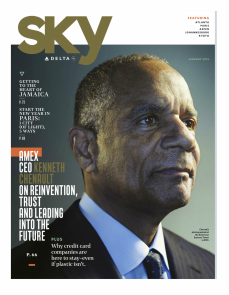 Delta Sky is the world's most-read onboard magazine with a circulation of over 5 million and introduces readers to the people, places and subjects that define our changing world. ​WTW's Camille Hoheb was interviewed on wellness tourism and how wellness has changed air transportation, the way people travel and the way in which businesses are responding.